As a citizen of the United States of America there is much in my country that provides me with cause for anguish. The Union wages a war which she is unlikely to win, the elected officials who operate the cogs of government give no heed to its founding charter, and my fellow citizens stand idly by, content to play the part of sheep. Add the standard list of modern tribulations - a rapidly changing climate, increasing financial instability, a general disregard for liberty, etc. - and you have a torrent of affairs with which the concerned citizen must contend with. This wide array of rather important public issues combines unfavorably with the limited number of hours in a day. The time-crunch prompted by this combination regularly forces me to justify my interest in oft-ignored problems such as stealth conflicts. The question is generally posed along these lines: "Why spend effort stressing about the media's portrayal of third-world conflict when there are real and pressing problems facing the world?" My answer to this query is simple: the existence of invisible conflicts is dangerous to the health of the American Republic. Stealth conflicts are those wars the rest of the world never hears about. They are conflicts that carry a considerable human cost but never seem to find a place in the international consciences, progressing and digressing undetected by those not immediately affected by them. Virtually ignored by all forms of media, such wars are started, waged, and won without ever making a blip on the public radar. They are, for all intents and purposes, invisible. Yemen: New terror camps as city falls to jihadists. James Novak, Long War Journal, 1 March 2009. In January, Yemeni President Ali Abdullah Saleh asked his network of loyalist jihadists to prepare for offensive operations against domestic “enemies of the state.” In return, Saleh has ceded authority to fundamentalist fanatics who seek to impose a neo-Salafi theocracy in the religiously pluralistic country. It is unclear if this is the full extent of the quid pro quo. Facing threats in the north and south, and an increasingly poverty stricken and desperate nation, Saleh has embarked on a strategy of empowering Islamic militants who, in exchange, have been given a free hand over some local populations. At a meeting in late January, Tariq al Fahdli headed a large delegation of “reformed jihadists” who met with President Saleh in Sana’a. Al Fahdli is a bin Laden loyalist and former al Qaeda operative. He is an in-law of Brigadier General Ali Mohsen al Ahmar, Saleh’s half brother.... The next week, security officials released over a hundred militants from jail including dozens of al Qaeda operatives. Al Fahdli asked for YR five million and settled for a three million riyal budget as sufficient to orchestrate the regime’s directives. Militants established several new terror training camps following the meeting. In Jahr, Abyan Jihadists declared an Islamic Emirate. Nine homosexuals were gunned down and murdered in broad daylight. Shabwa Press reports “wine drinkers” were severely beaten. Fundamentalists also attached threatening leaflets to homes, condemning certain women. Tariq al Fahdli, “using elements of the mujahideen for help and security,” took over various buildings and plots of land for distribution to his inner circle, the paper said. The hostile takeover of an entire city by Muslim terrorists with a connection to Al Qaeda is a news-worthy event. However, outside of the specialist publication Long War Journal not a single Western newspaper picked up the story. Indeed, a conflict that has displaced upward of 70,000 people has seen precious little coverage in the media at all, despite Yemen's well known status as a terrorist safe-haven. A quick search for the word "Yemen" in the archives of the New York Times provides readers with a small blurb about a bombing that killed 4 South Koreans, but nothing else about the country or the conflict therein. A search of the Washington Post archives yields similar results; once again coverage of the country focuses exclusively on the March 12th suicide attack on South Korean citizens. Post Reporters, Bankok Post, 12 March 2009. Prime Minister Abhisit Vejjajiva has approved the deployment of another 4,000 troops to the troubled southern border provinces of Narathiwat, Pattani and Yala. He announced the deployment after chairing a meeting of the Internal Security Operations Command (Isoc) on Thursday. The prime minister said more troops were need to counter the activities of separatist militants in the deep South and discourage local teenagers from joining militant groups by opening up more education opportunities to them. "I have authorised sending an additional 4,000 rangers. Their mission is non-combat. They will work towards a better understanding with local people," Mr Abhisit said. Did you know that Thailand is embroiled in an Islamic insurgency? Few do. The main-stream media is silent on the subject. Again taking the New York Times and Washington Post as examples, a quick search of the archives of both papers shows that neither felt it necessary to spend ink on the subject once over the last three months. I could go on like this for quite some time. Certainly there are conflicts more destructive than these two that the general populace is unaware of. The reason I chose to highlight the insurgencies in Thailand and Yemen is simple: one cannot deny that America has a stake in their outcome. While the United States government has dropped the phrase "Global War on Terror" from its parlance, the fact remains that the United States is still committed to fighting Islamic insurgents across the globe. This leaves one disturbing question: how shall a government run by the people respond to problems the people do not know exist? Jefferson's words remind us of an uncomfortable truth: one of the great burdens of self-governance is the responsibility of the citizenry to remain informed and educated in the affairs of the state. By all measures the great majority of Americans fail to take this responsibility seriously. Not a week goes by that a new study claiming that the average American's knowledge of geography, science, foreign affairs, economics, history, or the structure of federal and state governments is woefully inaccurate and inadequate for modern times. This laxity on the part of the American people will have its consequences. If Americans refuse to seek out knowledge necessary for their survival and liberty such will be taken away from them in due course. Yet this is what makes stealth conflicts so unsettling. You cannot blame your average American's ignorance of insurgencies in Yemen or Thailand on laxity. Apathy has not caused the invisibility of invisible wars. In essence, ignorance is being forced upon the people of the United States. Where shall the the concerned citizen turn to make informed judgments of the world around him? What media outlet presents the world with any semblance of proportionality? NPR? CNN? The New York Times? This is why I concern myself with the cause and continuation of stealth conflicts. A people cannot live both ignorant and free. The people of America deserve the chance to choose one way or another. This post has been cross-posted at the Stealth Conflicts Forum. Lt. General David Barno, the former commander of U.S. and NATO forces in Afghanistan, gave testimony to the Senate Armed Services Committee on February 26. His testimony is not small (30 pages in PDF form) but is an essential read for those concerned with the future of American efforts to stabilize Afghanistan. While much in the testimony was brilliant, one particular section of his report prompted an immediate double take; for the first time since I began my education in geopolitics I find myself seriously doubting America's ability to win the war she is waging. 2009 – Stabilize Phase (Holding Operation): Focus a surge of US and Afghan forces, and additional combat forces from other partners willing to contribute, on the central essential task of protecting the population during the August 2009 elections and on stabilizing the security situation. The election outcome will be a key test of legitimacy of the Afghan government, and indirectly, the international effort. A successful election outcome – one that meets international standards of fairness and transparency and strengthens Afghan institutions – offers the chance to hit the literal re-set button, restoring the legitimacy of the Afghan government and with it the credibility of the international effort. 2010 – Protect / Regain the Initiative Phase (Counteroffensive): continue to protect the population and state institutions while persuading, enabling and mentoring the Afghan government to govern more effectively – top-down and bottom-up. This will entail substantial growth in security forces: US, allied, Afghan Army and Police. 2010-2015- Building Success Phase (Consolidation): – protect the population, build Afghan state and non-state institutions. Improved security built from the bottom up around the country provides space for concurrent growth of key economic and governance functions. Success in the security sphere incentivizes reconciliation efforts. Begin selective transition (Afghanization) in the north and west. 2015-2025 –Transition /Movement to Afghan Control: continue selective transition -- as further geographical areas (provinces/regions) or functional aspects (e.g. agriculture, local government, customs and border protection, policing) of the state achieve sustainable stability, hand-off control over them to responsible Afghan institutions. International military presence draws down. Continuous – Prevent (Counter-Sanctuary Operations) Throughout the operational sequence above, the “prevent” task is concurrent, continuous, and (because it disrupts other tasks) is conducted only to the limited level needed to prevent another international terrorist attack on the scale of the 9/11 attacks. Tactical opportunities which undermine broader strategic goals are avoided. To be clear: Barno is proposing a strategy that will take 14 or more years to complete. This plan requires the number of American troops in Afghanistan to "surge" for the next two years. If the European nations of NATO do not increase their own troop levels, the U.S. is required to pick up the slack and provide the soldiers. The majority of these men and women will be rotated in and out of Afghanistan until 2015, and the last will not leave until 2025. This timescale is not unusual for successful counterinsurgency campaigns; following the Spanish-American War the United States spent 14 years putting down the Philippine Insurrection, while the British launched an 18 year campaign to end the Malayan Emergency. In both cases, the counter insurgent power developed a long-term plan to stabilize the nation occupied and isolate the insurgency from the main population. Lt. Gen. Barno (with the advice of COIN expert David Kilcullen) has developed such a strategy for Afghanistan. The question then, is simple: can the United States implement this strategy? I am sorrowed to say that I do not believe she can. The American public's reaction to COIN efforts in Iraq provides a perfect example of this. 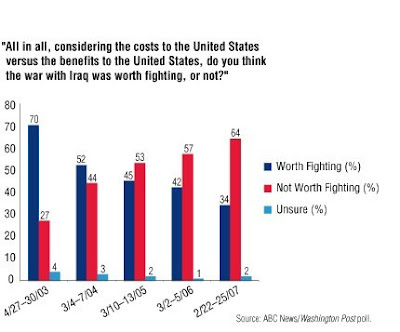 As the graphic below displays, one month after the dismemberment of the Baathist regime 70% of the American public believed the war with Iraq was worth fighting for. This support for Coalition efforts was completely unsustainable; within a time span of four years public opinion had flipped. By February of 2007, 64% of the American public stood firm in the belief that the war in Iraq did not provide benefits to the United States. What caused this drastic change in opinion? The first answer to that question is simple: the public could not tolerate the rising number of American men and women dying in Iraq. As the number of casualties (hostile and non-hostile) grew, so did opposition to the war. That the majority of these deaths were not the price of battlefield victories but the result of attrition warfare only added fire to the flames. To observers, the United States seemed stuck in a quagmire, playing the role of Hannibal to the insurgent Fabius. The more you protect your force, the less secure you may be. 2-1. The U.S. military, designed to inflict overwhelming and disproportionate losses on the enemy, tends to equate victory with very few body bags. So does the American public. The new counterinsurgency doctrine upends this perceived immunity from casualties by demanding that manpower replace firepower. Soldiers in Afghanistan must get out among the people, building and staffing joint security stations with Afghan security forces. That is the only way to disconnect the enemy from the civilians. Persistent presence—living among the population in small groups, staying in villages overnight for months at a time—is dangerous, and it will mean more casualties, but it’s the only way to protect the population effectively. And it will make U.S. troops more secure in the long run. It took America three years to decide that the number of casualties she suffered in Iraq was too high a price to pay in order to justify the occupation. With this fact in mind, ask yourself whether the American people will be able to sustain support for a fourteen year attrition-style campaign? The American media and political system makes matters even harder for the Coindistas. Seeing the widespread discontent with the way things were going in Iraq, the Democratic Party was quick to place a draw down in troop numbers to the front of their party platform. The media was even quicker at capitalizing on this political controversy and began to focus its attention on Iraq, ensuring that counterinsurgency efforts in the country would become a partisan issue. Thus, far from being the foundation a national consensus, the United State's "Iraq Policy" became the center of a ferocious national debate. The verdict of this trial was decided on in 2004 and once again in 2006. This frequent change in leadership and public opinion made it impossible to execute a long term plan for the occupation of Iraq. Now fast forward to 2009. Iraq is a dead issue; coalition deaths are at an all time low and the SOFA has forced a political consensus onto Republicans and Democrats alike. Iraq has all but disappeared from the news; the Project for Excellence in Journalism reports that not even 1% of last week's news coverage involved Iraq. Taking its place is the counterinsurgency in Afghanistan. The Scholar's Stage has previously reported that the American consensus on Afghanistan has been destroyed. As I noted in that post, the media's change in tone between 2008 and 2009 is astounding. A media storm is brewing, and once the "surge" is underway it shall break out in full fury. I have outlined the results of the last media storm. Is there a reason to believe this one shall be any different? Indeed, is there any feasible reason to think that at least one of the 2012, 2016, 2020, or 2024 major party platforms will not be pressing for a withdrawal from Afghanistan? A true counterinsurgency campaign capable of bringing Afghanistan away from the brink will cost money, men, and most importantly, time. These are things modern America simply cannot provide.